The Hugel family has been making wine in Alsace since 1639. With that sort of experience to rely on, it’s no surprise they make some of the world’s greatest wines. The estate is especially famous for its Vendanges Tardives (late harvest) and Sélection de Grains Nobles (or SGN: late harvest wines made with botrytis affected berries). Furthermore, it was Jean Hugel who was responsible for the introduction of INAO regulations legislating production guidelines of Vendange Tardives and Selection de Grains Nobles wines (first proposed in 1977, the law was finally passed in 1984). So you might say Hugel has a sweet tooth of sorts. Clearly, Hugel’s SGN wines represent the estate’s pinnacle of quality. These are wines of rare refinement and pedigree, as Hugel has always been linked with graceful and elegant sweet wines as opposed to overtly showy or excessively sweet interpretations (this was even more true back in the 1970s when Hugel’s SGNs were much drier than they are today). 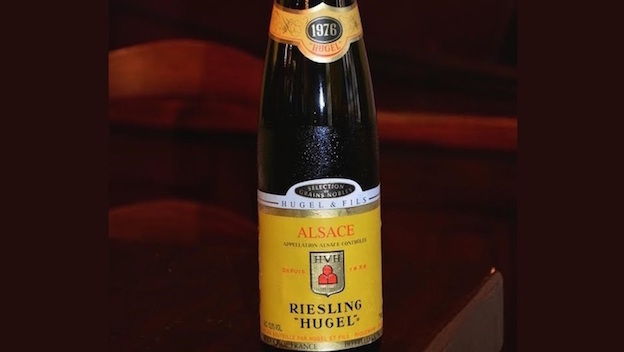 The relatively hot 1976 vintage is linked to some of Hugel’s best ever wines, a case in point being the 1976 Riesling Sélection de Grains Nobles. Wonderfully pure and long, with hints of lemony botrytis nicely complicating ripe citrus, crystallized ginger and peach aromas and flavors, the finishes practically off-dry, with a persistent, mineral-inflected close. A true work of art, the 1976 is an outstanding example of late harvest Alsatian white wine made in a style that speaks of a different, gentler, time. 97/Drinking window: 2016-2030.